Review of Bell’s Oberon Ale | Beer Apprentice - Craft Beer News, Reviews, Interviews and Info. Today, because of the impending heat, I’m going to review another Summer beer. The Bell’s Oberon Ale from Bell’s Brewery Inc. located in Kalamazoo, Michigan. I’m thirsty, so let’s get right to the description from the website, bellsbeer.com. Sounds good. Let’s get it in the glass. 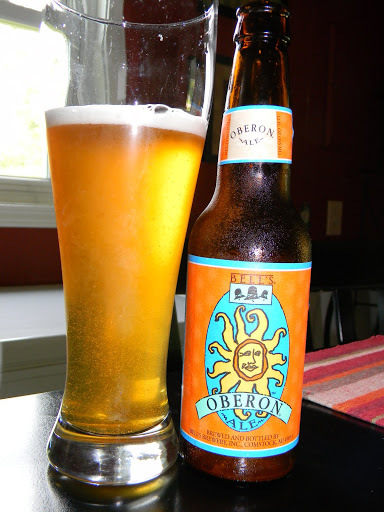 The Oberon has an ABV of 5.8% and comes in a 12 oz. bottle. Appearance wise, this beer poured a sparkly golden/orange color with some bright yellow highlights around the bottom and edges of the glass. It was cloudy and hazy with some suspended sediment easily seen when peering through. A very bright white head was formed that was both fluffy and soapy. It had a small volume, ok retention, and average lacing. Nothing too spectacular, yet nothing horrible either. The aroma was a very well balanced, however very mild, nose of orange and lemon citrus. A minor amount of floral hops were noted and I didn’t really find much spice in the fragrance either. A wheat and bread hint was duly noted, but overall I was a little surprised by how “weak” the smell was. As I took the first sip, I was greeted with splashes of orange and a bready, grainy distinction. A touch of sourness was detected, but it wasn’t much really. I found the taste to be a bit yeasty with only the slightest spice tinge. A subdued amount of hop bitterness tickled the tongue to give the experience a touch more complexity. The characteristics were a tad more prominent in the taste than the smell, yet they were still a bit restrained I thought. It was still balanced ok though. The mouthfeel was medium to thin, smooth, crisp, ultra refreshing and thirst quenching. A little bit of flavor was left on the palate, but it faded pretty quick due to the somewhat watery finish. Well…. this beer is super easy to drink and definitely fits the “Summer” style well. Without a doubt, this could be a beer to drink at a BBQ or while at the beach. I would say that, overall, it’s on par with most brews of this style. It’s nothing too complicated or outstanding, although I’m not sure it’s required with this style. Pretty straight forward really. If you like the Summer seasonals, for sure give this a try, but if you are looking for a complex beer drinking experience, you may want to look for something else. Thanks for reading and commenting everyone. I hope everyone stays cool and has a great weekend. I dug through your blog looking for a brew that you and I had both reviewed. Although I've had several of the beers prior to this one, this was the first one that I had actually reviewed. Another thing to note is, not only do I live in Michigan, but I also work in Kalamazoo. Bells, in my opinion, is WAY over rated. When Oberon is released each summer, I have to listen to people acting like it's water pouring from the Sistine Chappel. I actually work in Battle Creek, MI…home to Arcadia Ales. They brew Whitsun, which is a comparable beer, and now canned. I think it actually tastes a bit better, mostly in smoothness and mouthfeel rather than complexity. It's good to see an unbiased beer reviewer see that Oberon isn't really liquid crack in a can. Thanks for reading and commenting. I appreciate it. As far as the Oberon, I liked it ok, but I wasn't completely blown away by it. It just reminded me of most of the other Summer seasonals that are out there and they have never been a favorite style of mine anyway. With that being said, I could still drink it with no problem, but like you, I don't see what all the fuss is about. I do like quite a few of Bell's brews. I like the Porter, the Kalamazoo Stout and the Expedidtion all ok. I'm fortunate to be able to get most of them on a regualar basis. Thanks again for reading and commeting. Check back from time to time if you have a few extra minutes.